Use of the building and time has been agreed to with the Historical Society. We will continue to have the use of the entire building on the 3rd Sunday from 12-3. They will not use the building for the farmer’s market on the 3rd Sunday, although they might start using the grounds during the warmer weather periods. This might change for 2019. Members are encouraged to keep an eye out for other possibilities for a permanent meeting location. Discussion of upcoming demonstrations resulted in Mark K. agreeing to do scrapers (including negative rake scrapers) for the March meeting. Carbide turning tools will be the likely topic for the April Meeting. The president’s challenge was to do something and use a negative rake scraper on it and be prepared to discuss your experience. Safety Experience – Use the Powermatic grate for starting off balance pieces and when turning green wood without the tailstock. Jeff B. described very large, wet piece coming out of chuck when tailstock was not used. Was very grateful for the grate catching that piece. Eisenhower Center update from Dan K.
They could use some helpers since some of the usual ones are gone or out of commission right now. You don’t need to teach turning, just be a second pair of hands to help. Also need wood donated as most of what they had has been used up. Get in touch with Dan if you have some to donate or bring it to the meeting. The program has been funded by the Center, donations, and tool shop sales. Consider donation of tools of all types for resale at the ToolShop to benefit the EC. 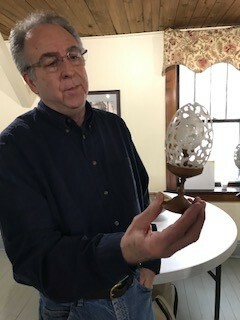 Mark showed some negative rake scrapers he made and sample work with them. A raffle was held for several nice pieces of wood and a special raffle for an assortment of abranet or foam cushion sanding disks. Demo Announced for February Meeting! At our February 18 meeting, John Fink will be presenting a demonstration on basic design considerations. Should be a great talk that generates a good discussion. See you at the next meeting! 1. We discussed breakdowns with Webster Historical Society, the Farmer’s Market and our meeting schedule. 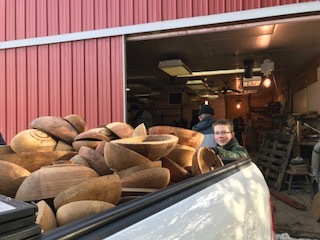 We have a few options: move upstairs during the Farmer’s Market, move our time to 3-6 on Sundays, meet at Eisenhower Center, move to the Tool Shop in Westland. We decided to keep the same hours and move upstairs for now. Dan Chapman and Jeff will talk with Thelma, the current Society president, and confirm. 2. We discussed the need for 3 officers; Vice President, Treasurer, and Secretary. 3. The Treasurer’s report showed that the Holiday Sale brought in $2903 and that we contributed $600 to charities. The Club made $364. 4. Dan made the suggestion regarding the Webster Fall Festival that vendors pay the table fees, not the club. He would also like to see the raffle proceeds from the Holiday Sale to go to future holiday sales and he would like to charge members per table for the Holiday Sale and non-members a bit more per table. 1. Jeff introduced three guests: Carroll, Jim W and Jim H.
2. We talked about the meeting schedule conflict and agreed to meet upstairs at the same time. We will let the membership know if the Webster Historical Society has a problem with this. 3. Steve gave the Treasurer’s Report and let people know that his official duties were done as of this year. 4. Dues need to be collected: $60 per member unless you are a junior member. Junior members do not pay dues. 5. Officer elections: John Fink agreed to be VP until he moves. Jim Westgate agreed to be secretary in partnership with Erica. Steve agreed to continue on as treasurer for a while. This allows us to go ahead and pay for club insurance given that we have a full roster of club officials. Karl suggested that the club buy AAW membership for any members interested in running. The members present voted to pay the first year’s AAW membership for a non-AAW member willing to become an officer. 6. Dan brought up the topic of safety in using chain saws: don’t do it at night. 6. We moved on to demonstration topics for the year and we talked about finding a way to see videos on certain topics, i.e. you tube, DVD’s, etc. We also talked about having guest demonstrators and the need to pay them for coming. 7. Eisenhower Center community work. We work with traumatic brain injury clients in a workshop behind the South Building, 3200 Eisenhower Parkway, on Tuesday and Thursdays from 3-5. We also have agreed to mentor people on the second Saturday of the month from 1-4 there. We finished our women in turning grant in November and 21 women participated and may come to the Saturday learn and turn. Erica will send out an email to the club as a reminder before each Saturday. Please RSVP if you want to come so we don’t get overbooked. And of course, we would be happy to include you in the regular Tuesday and Thursdays and can meet an hour earlier if you want some mentoring time. Just call Erica or Dan. 8. We had a show and tell time with Mark, Jeff, John, and Gary showing items including miniature goblet, cigar case, bowls, vessel, and pierced goose eggs!! Will have pictures uploaded on our website. 10. We had an auction of tools and exotic woods from Russ’s workshop which totaled $300. Next general membership meeting is Feb 18 at 1:00pm at the Crossroads Community Center, 2nd floor. The reminder that is sent out before the meeting will have information on the demonstration for that meeting. Thanks Erica for the quick turn around on these meeting minutes. Many of club members volunteered to help Russ move his workshop on Saturday, January 20. 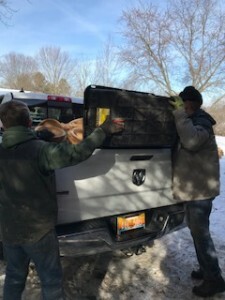 Here are some pictures that show Dan’s truck loaded to the brim with bowl blanks, and the barn that we transported all of Russ’s extraneous equipment to including the goats that guard the barn. Kudos To Joe, Dan K, Bruce, Ron Hall, Erica and Robert, Bonnie, Al, Pat, Jeff Salter, Charles Bradley, and moved all sorts of items that of been collected over the years. Executive Forum today covered the following items which were expanded upon in the General Meeting. We had 5 new guests at our meeting. 1. The WIT grant was a success with 21 women participating. Some of these women wanted to continue to turn on Saturdays. We have scheduled Dec 9 from 1-5 as a Turn and Learn day at Eisenhower Center. 2. After several negotiations, our latest building agreement includes the following: We continue to pay $50 per month; We continue to be able to have our Holiday Sale if we have Webster Historical Society as one of our Charities; We meet at our usual time of 1pm instead of the 3-6pm that we had thought we had to switch to; our members can sell at their Farmer’s Market, and the FM vendors can participate in our Holiday Sale. 3. We are not meeting in December other than at the Holiday Sale. 4. The treasurer ordered new checks and noted that we will need three new officers in 2018. Steve’s term is up. 5. The officers approved the expenditure for the Holiday Sale signs. Holiday signs were distributed among the membership. Please check to see if I accurately recorded who took a sign and at what location they were placing it. Those who took signs need to pick them up after the sale next Sunday afternoon and return them to Crossroads Community Center. We also discussed letting the Farmer’s Market folks use our big signs for their purposes. She uses “DustBGone” and a 3M air filtration system which is very expensive. She told us that many clubs have safety officers. She pointed out that orientation is very important. She uses dry wood though has experimented with green wood which has to be done in one day. In order to get her b owls very thin, she uses a square scraper (David Schweitzer or Don Derry system as hollowing tools for spindle hollowing. She talked about the use for negative rake scrapers and suggested we watch Sam Angelo’s video on this tool’s use. She sands her pieces to 600. She has a 699L and cleans the bit with a welding rod. The dental drill burns as it turns and she uses it from left to right because she is left handed and moves clockwise with the drill. She showed us the micro motor Mystica which runs up to 30,000 and demonstrated cutting dimples. She sprays some of her pieces with archival Crylon finish. Her talk on Design was interesting as she showed us with a chain what Caternary curve was and said that shape is most important. Next is proportion and shared a golden mean guide with us. She said she got different ideas for design from coloring books and from nature, (tracing leaves, eg.) 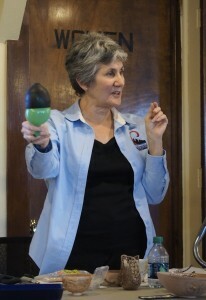 She also shared a trick using an inflated balloon within a piece in order to paint the outside. She demonstrated how to divide a piece into an odd number of sections using a compass and protractor.Then she draws grids as guides. Kathleen did let us try her tools which was great fun! Dan has requested that woodturning vendors donate a piece/bowl/ for the raffle. This is how we reimburse our club for expenditures relating to the Holiday Sale. He also asked that people let Erica know if they would be willing to demonstrate on the lathe. 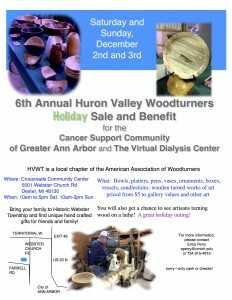 6th Annual Huron Valley Woodturners Holiday Sale and Benefit! 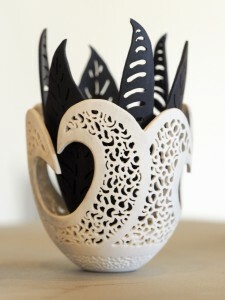 Be sure to check out her amazing turnings on her website and come with your questions! 1. Steve, our treasurer, had sent out a report of our current balance. 2. Our next meeting will take place the Sunday after Thanksgiving (November 26th from 1-3.) We will have a nationally known woman woodturner demonstrating piercing. We are paying her $150. Erica is double checking with Thelma Tucker to make sure this change of date is ok. Dan Chapman is almost 100% sure that it will be fine. We discussed whether to charge non members. We agreed not to so as to encourage more people joining our club. Jeff B. has agreed to help Dan K with bringing up the TV monitor and set up. 3. Our Holiday Sale is Dec. 2 and 3. Mark agreed to work with Erica on publicity and getting it together. Erica got a sense of who wants to sell at the show. We talked about spending some money on publicity this year with either posters or more roadside signs. There was a lot of agreement that roadside signs in the same colors as flyers make sense. Lots of great suggestions emerged from the discussion. Places to advertise included: the Patch, Current, Sun Times, MLine, and local highschool electronic billboards. The sale/benefit will take place at Crossroads Community Center, 5501 Webster Church Rd, Dexter, as in the past. 4. We continue to need club officers. 5. 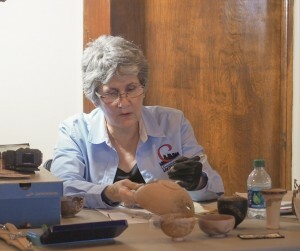 Erica updated information about the WIT grant and Eisenhower Center. Dan is currently picking up the Robust lathe. 6. The next craft fair is in Frankenmuth. Dan and Erica are going. 7. Russ talked about the recent craft fairs at Pioneer Day and Bruce talked about the Woodcarvers’ Sale in Saline. 8. John Westman has invited the club to come and visit his new workshop in Webster Township. The club all agreed that we would like to start doing workshop visits again to get new ideas on what’s possible in a workshop!! 9. The club would like to have a list of all potential craft/art fairs. It was suggested that we have a presence at the Novi wood show. And Dexter has a fair at Creekside that is nearby. 10. Mark suggested we create a membership application to handout when guests come. 11. One more ticket needs to be sold before we can draw the special raffle for the buffing system. 12. We did not have a regular raffle today. 13. Erica brought in a slippery elm burl for show and tell. 14. Mark gave us a great demo on joinery. He told us that people did joinery over 4500 years ago. He then went into a variety of kinds. Dovetails were developed to allow for expanding and contracting. Box joints provide more surface area and the more SA, the better the joint. Tongue and groove also allows for expanding and contracting. He passed around miter joint and other samples of joinery including rabbet joints and guitar neck joints. He brought tools he used including a diamond point scraper with an 85 degree angle. He brought “reassembled” lamp and a remarkable globe comprised of more pieces that he could tell us. He discussed its construction which used a router. His next challenge is to take orbs and do offset turning. Members asked lots of questions and John F mentioned mounting a chain saw on a lathe and mentioned Mark Linquist as someone who has done this. 15. Finally, we talked safety. Joe talked about tripping over extension cords when they are covered by sawdust. And the group talked about how chain saws are very dangerous. Mark said that many students mess up because they do not think ahead of time about what direction of force the tool delivers and how much you, the human, have to compensate. Thanks, Mark, for a great demo!! Jeff Braunscheidel (president), with input from Steve, Ron, and Dan, discussed most of the items covered in the Executive Forum. Steve (treasurer), reported our account balance and recent expenses paid. 20 people have paid dues. We have 23 people in our club with the junior members included. Jeff talked about the AAW incentive running through July where club members who have never joined AAW can join for half price ($30). We will have a Learn and Turn next Saturday, April 29. Jeff, Erica and Dan will be there. It occurs at the Eisenhower Center and will run from 1-4 pm. People need to bring wood and tools. You don’t have to stay there the entire time. The website looks good. Jeff summarizes our meeting notes for Pat to put on the website. Jeff pointed out that there are very few pictures of our meetings and work on the website. Steve asked that anyone having pictures from club meetings place them in “Dropbox”. He needs our names to give us access to this program that captures large amounts of memory. Contact him if you have any questions. The position of secretary is still open. While Erica is filling in temporarily, we really need someone to step up and take this over. Anyone willing to cover this should contact one of the officers or talk to Erica if they have any questions. Ron brought in the club patches which look fantastic. We passed out these patches to each attending club member today. Every club member gets one patch free and if anyone wants another patch, they are available for $2. Erica kept track of who got the patches. We discussed the building agreement. It was suggested that instead of renewing it each year that we request an ungoing use agreement that would not expire. We would simply provide a calendar of meeting/event dates at the start of each year. Jeff and Steve will work on this. Dan Chapman mentioned that there might be the possibility that we could hold our Holiday Sale in Dexter at a centralized building there, thus putting our work in easy access to the holiday shoppers. This month the special raffle is an assortment of abranet sandpaper disks. Next month it will be the Beal Buffing System. Dan is looking into something that will allow this to be more easily used on any lathe with a #2 morse taper headstock. Erica will be sending out a contact list now that most of the dues have been paid. This list will also be used to receive discounts from Hartville and Klingspor. A former club member has offered his large workshop for a place to hold demonstrations from professional turners. The Exec Board will look into this. Steve St. Charles talked about safety issues of which one is turning unstable pieces of wood. He was lucky he was wearing his shield when one he was working on came off the lathe and wacked him pretty good. We had three guests today, one of them (Robert) talked about his turned pens. The finish he uses is CA glue. Another brought in an assortment of bandsaw blades for the group. Mark brought in his three lamps, each made of different wood. He also talked about his use of Elmer’s glue instead of Anchor Seal for sealing wood end grain….much cheaper and accomplishes the same thing. 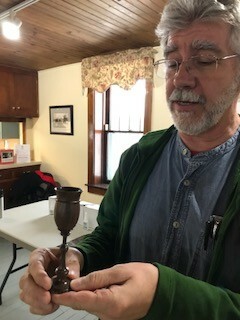 John Fink showed us his tapered reamer that he made to helps him insert stool legs. He used a dry wall saw blade and hard maple. Karl showed us his eucalyptus ringed bowl and explained how he made it. He advised that the bottom of bowls should be a third of the diameter. 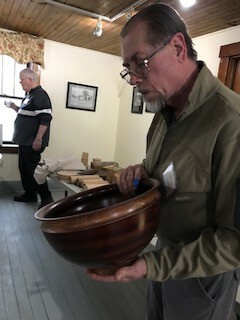 He also showed us another ringed bowl that had veneer to separate the rings. 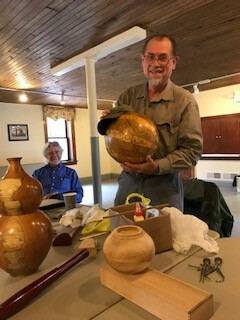 Dan showed us his cherry and Bradford pear vessels. He uses the min-wax, wipe-on poly with sanding at 400 between the 8 coats. Steve showed us the chopping board for his “mezza luna” vegetable cutter. The finish was mineral oil. He likes Penn State to buy the kits which have all the instructions we need. He uses both wood and acrylic. He showed us the slotted wood in which he lays out the order of pen parts so that he doesn’t screw up. He sands the brass tube so that the glue/epoxy will hold. He drills a hole in the blank. He drills ½ way through and backs out slowly to avoid chipping. The cutting bit is specially sized to match the type of pen being made. Using special jaws on his chuck he holds the drilled blank with the brass insert glued in and carefully cuts the end of the blank square down to the brass insert. He puts the mandrel on the lathe then puts the drilled blank with the brass insert glued in unto the mandrel. Turning acrylic can be tricky because eyeballing the colors impacts depth perception. He advises turning acrylic slower. He sands starting at 320, then 400, then 1500. He also demonstrated the use of the press to assemble all the parts of the pen once the turning was completed. The cost of all the various tool aides he used was about $150…pen press, pen mandrel, pen jaws, punches…..
Several years ago Jose Avila, a staff member of the Eisenhower Center (EC), an organization working with folks with Traumatic Brain Injury (TBI), approached our outreach coordinator, Russ Clinard. He wondered if our club ever worked with these unfortunate accident victims, veterans, and athletes whose brains had been injured. This population varies a great deal in symptoms but TBI can affect speech, walking, thinking, fine motor coordination, and emotional control. Russ initially invited several EC clients to his own workshop and they started making a wooden football and a baseball bat. As more clients indicated an interest, Erica Perry, Dan Konyn and Ron Hall joined Russ in this volunteer work. It was such fun for both clients and our members, that Dan and Erica decided to write a grant to the AAW for a lathe that could be placed at the EC. This would allow more clients to become involved. We were thrilled to receive $1400 which allowed us to buy a lathe as well as several tools and other supplies. Initially, we had to carry the lathe from a first floor conference room to a courtyard where we mentored over 6 clients in doing woodturning. We began by going out to the EC once a week but soon realized that this did not meet the needs of our TBI folks so we added another day, Tuesdays and Thursdays, from 3 to 5. 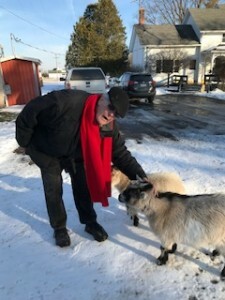 Dan realized that we would not be able to mentor outside in the winter and he and Russ spoke with Jose and Charlie, his boss, and discussed other possibilities. Erica called a board member and explained our dilemma. Shockingly, the board decided to spend $5000 and create a little workshop for us behind one of the campus buildings. Meanwhile, Dan utilized his “it doesn’t hurt to ask” skills and began to supplement our supply of tools, grinder, lathes, wood, etc. so that now we have three lathes in our little workshop and can mentor up to four folks at any given time. Hartville, Woodcraft, Lee Valley, Penn State, Packard, and Yazaka, have all contributed out of the kindness of their hearts so that we now have quite a wonderful space to mentor in. Each of the TBI clients is a character in some way, and a sweetheart as well. They have amazing stories to tell about how they came to have TBI and they very much appreciate our listening as well as our mentoring of woodturning. One woman is wheelchair bound, can hardly use one hand, yet is making wooden pendants and earrings that she paints. She was run over in a hit and run over 20 years ago altering her life forever, yet she maintains a sparkle in her eye and funny sense of humor. Another client also is in a wheelchair and we have watched his fine motor skills improve dramatically as he moved from making candlestick holders to bowls. He joins Russ and Ron in teasing Erica mercilessly, and a wonderful camaraderie has developed. One Afghanistan war vet told us that this was the best therapy that EC offered. We also are able to use this workshop for the Learn and Turn Saturdays that we have planned for this year. Russ, Dan, Erica and Ron welcome any club members who would like to mentor these fascinating and grateful folks. Please contact Dan for coordination and times if you are interested. His telephone number is 734 658-4238. His email address is dankonyn@gmail.com.